Our Revision Delegation programme is designed to support schools and centres as they prepare their students for GCSE and post-16 examinations. Drawing on the experience of successful teachers and inspirational speakers, the programme offers great new ways to get across the same old message using a memorable and effective format. Our successes have seen a number of our centres achieve their best results ever…and whilst we know that this is due not only to the massive efforts of the students and – of course – their teaching staff, the feedback we have received suggests that we played our part as well. Not surprisingly, we’re very happy about that! We know that schools and colleges really can choose from a host of providers to give their students that all important boost when the right amount of pressure at just the right time is crucial to the success of their students. And we accept that other providers are – in all probability – good at what they do. The TfL difference is simply that all of our presenters come to you directly from the proverbial chalk face/whiteboard and they can only work for us if they genuinely have an outstanding track record with exam successes with GCSE and A Level students. All of our presenters have up to date experience of the classroom and some are still in it on a very regular basis – so you can rest assured that they are living the dramas associated with exam teaching and present workshops which focus on practical and applicable approaches to revision. 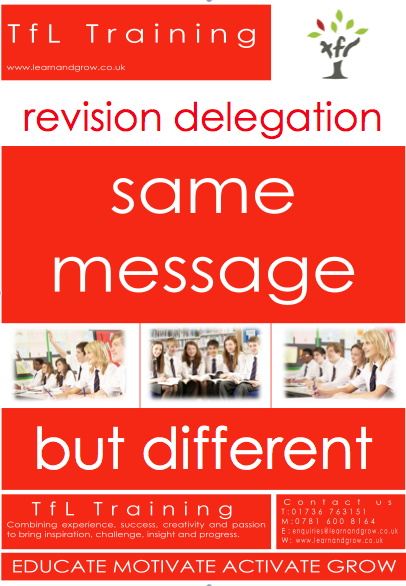 Our Revision Delegation programme takes the form of a training conference where the students become the delegates. They have their own Delegate Lanyard and Delegate Commitment sheet which they complete during the presentation and use as a support framework during the passage of the revision process. Each of our presentations are specifically tailored to suit the needs of the school and we know that schools appreciate that they are not simply being delivered an off-the shelf package. Our 2015/16 programme has been adapted slightly in response to feedback from previous teaching staff and ‘delegates’ and we are confident that these amendments add considerably to what was already very-well regarded and very-well received exam intervention.